Our first stop in the Alpes-de-Haute-Provence today, was the village of Castellane, which sits on the Route Napoléon at the entrance to France’s largest canyon, the Gorge du Verdon. 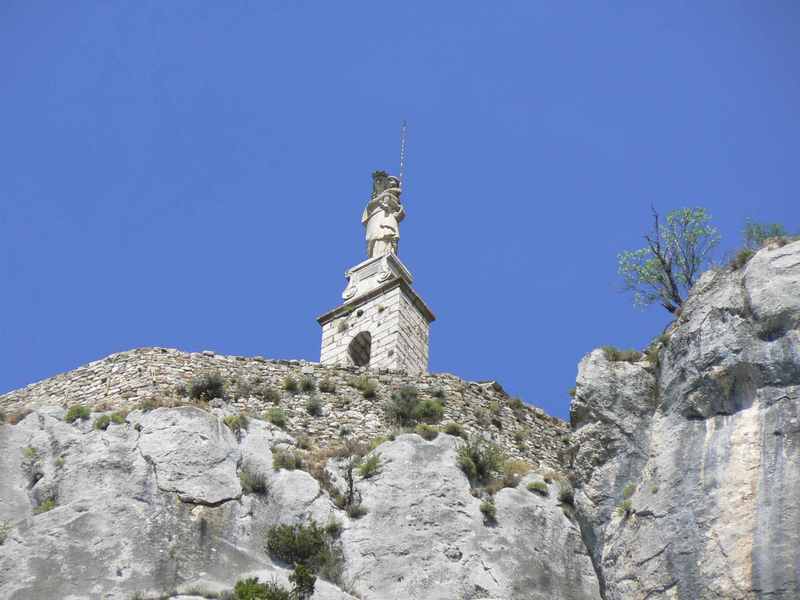 Napoléon actually had lunch in Castellane on March 3, 1815, with the Chapelle Notre Dame du Roc standing watch over him from its commanding position 180 meters above the village. Our first glimpse into the spectacular scenery of France’s Grand Canyon was from Point Sublime, where we could see how the Verdon River has cut profoundly into the rock to create the rugged landscape. We arrived into the charming village of Moustiers-Ste-Marie about three hours and several stops after we left Antibes, heading northwest through Grasse following N85 to Castellane where we cut over to D952 into Moustiers. It was a lot hotter than we expected – much hotter here at 631 meters than it was in Antibes at sea-level. 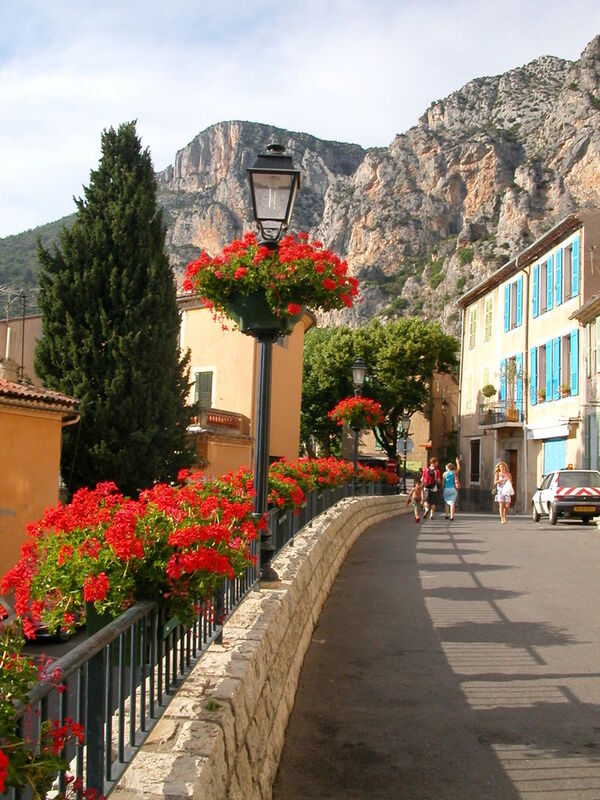 We were happy that we chose Moustiers-Ste-Marie as our base in the area, rather than Castellane, which we had also considered. Moustiers was so picturesque, nestled into the surrounding cliffs with small bridges and small waterfalls, and it was much closer to the inviting Lac Ste-Croix, with its kayaks, canoes, and paddleboats. La Bastide de Moustiers was a perfect way to wind down at the end of the day. Their rooms were already booked up when we were doing our hotel search, but, fortunately, they had a lovely table for us on the terrace for dinner. 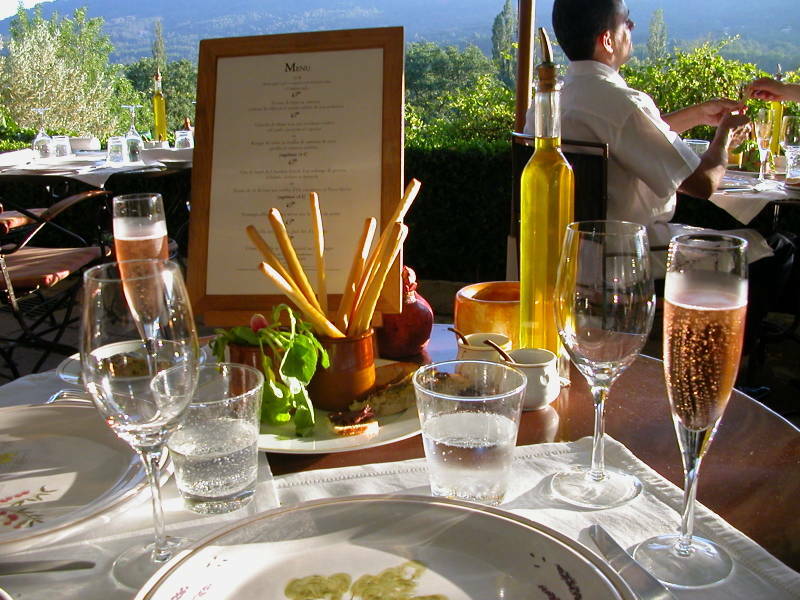 Although, it is a very nice hotel and a Michelin-starred restaurant, it is far enough away from the village to require driving back and forth. However, it might be worth the drive, considering that there didn’t seem to be any hotels as nice within the village itself.